Fab-Seal offers professional design, fabrication and installation of our flexible membrane liner, which can generally be installed in less than a week. If for any reason you have any questions or comments about our flexible membrane liner, feel free to give us a call at 800-874-0166 or fill out the form on this page and a representative will respond shortly. Our flexible membrane liner is made to contain the fluid that needs to be controlled, and the secondary containment flexible membrane liners act as a last line of defense behind the primary liner. 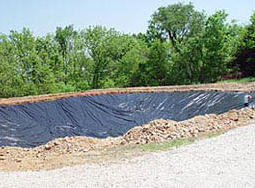 The purpose of a flexible membrane liner available from Fab Seal is to impede, restrict and control seepage of water and contaminants for environmental protection and water conservation. Fab-Seal strives to make our flexible membrane liner to be extremely compatible to nearly all inorganic and corrosive liquids. Our liner systems are fabricated in our factory using dielectric sealing of the same material. Our flexible membrane liner is professionally designed for your specific project or job, and installed by trained and experienced technicians. Fab- Seal has spent over 25 years building a reputation as a trusted manufacturer and installer of our flexible membrane liner systems and water tank liners for a wide range of industrial uses and applications including Pit, Pond and Lagoon Liners and in the design and fabrication of Primary and Secondary Containment Liners. A flexible membrane liner system from Fab Seal is considerably more affordable compared to our competitors and installed by trained, experienced, and reliable technicians. If for any reason you have any questions or comments about our flexible membrane liner, feel free to fill out the form on this page and a representative will respond shortly or give us a call at 800-874-0166.